Reminders Come In Surprising Ways! I am blogging about something that I am really excited about today! Let me see if I can make any sense out of it for you. The past week I discovered a new project. 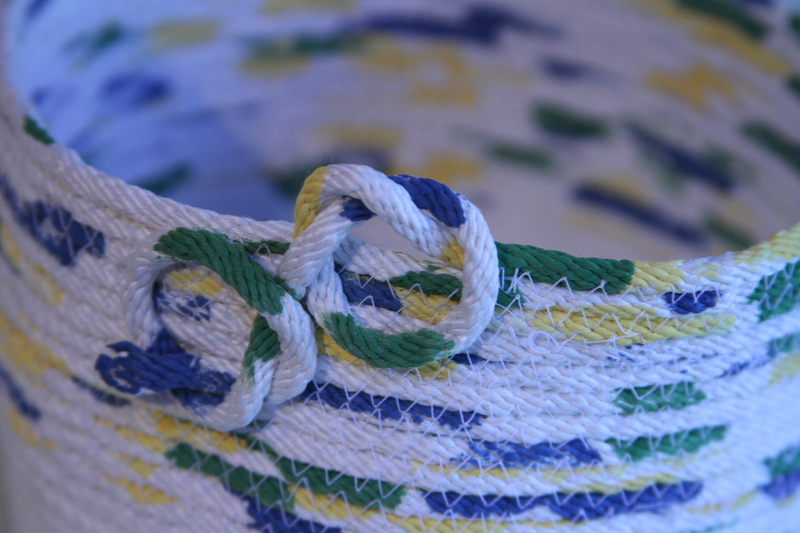 (Side note: I did say I would blog about why I make bags, but that is going to have to wait!) I started making bowls as a break from making bags. 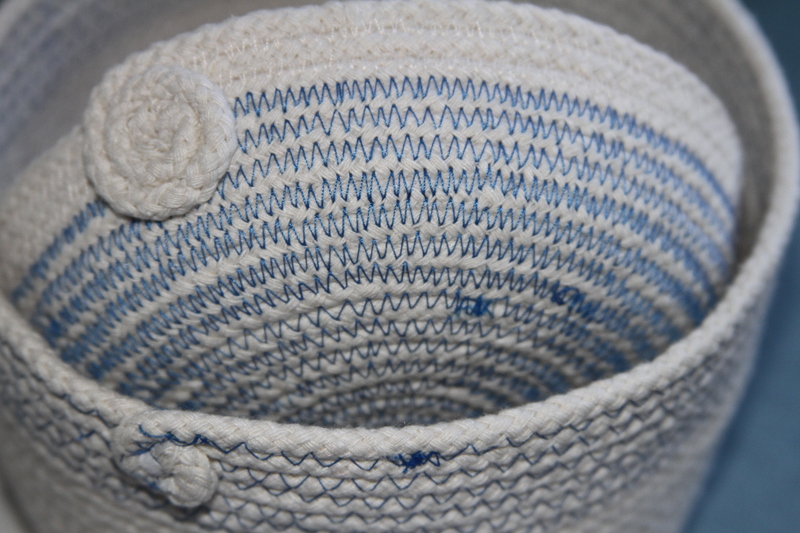 These bowls have been called coiled bowls, stitched baskets or other names. I think I should call mine Life Bowls, Lesson Bowls, Prayer Bowls, Meditation Bowls…or something that combines all these things. I started out making cotton bowls, using regular old clothesline. They are pretty and clean. I was hooked on the first little trial. The cotton bowls are simple and modern looking. 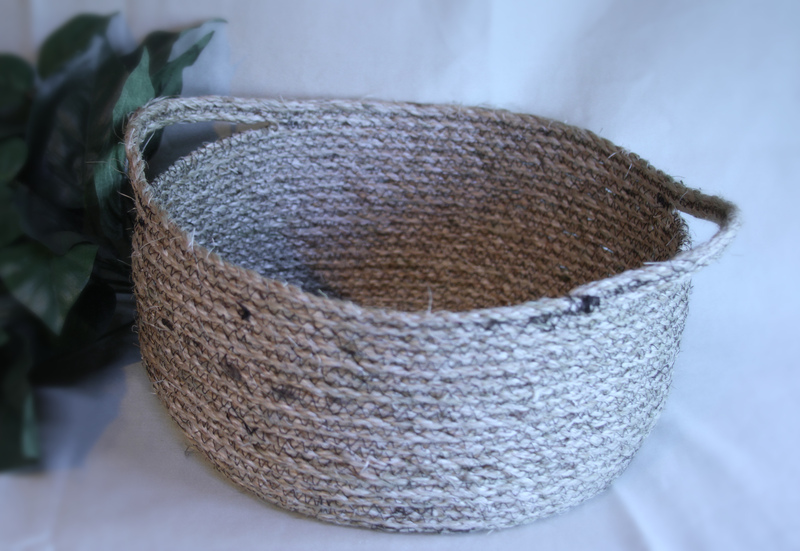 After making a few of the cotton bowls, I decided to graduate to sisal. 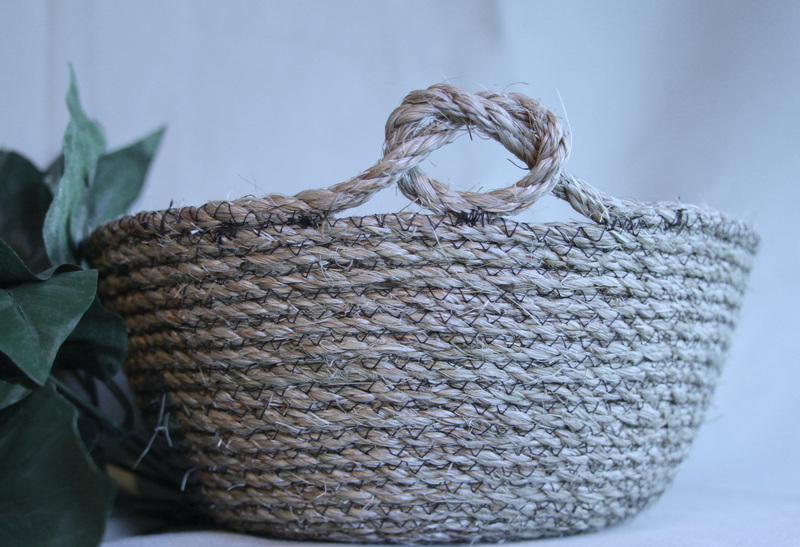 Now, I am really enjoying the look of the sisal, but let me tell you, it is much more challenging! 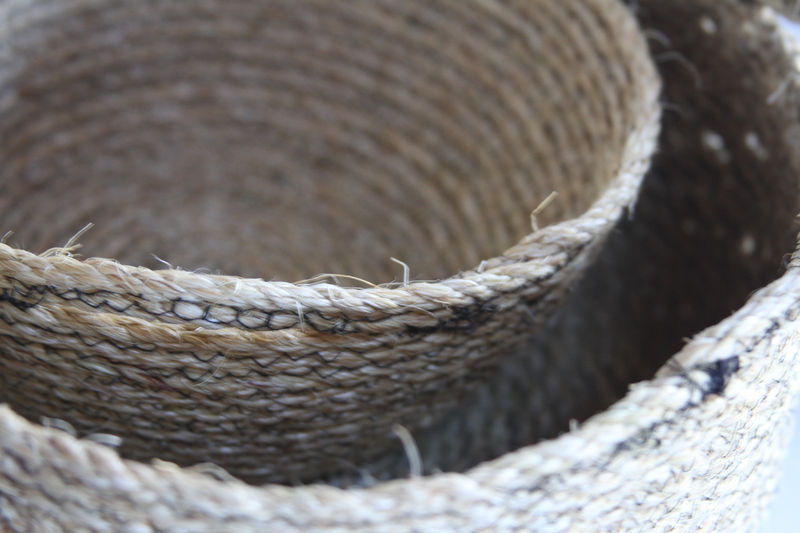 It came to me that working with the sisal to make these bowls is a lot like life. Life is full of rough spots, bumps, breaks, bruises, frustrations, failures, heartaches and more, but when we persevere, keep changing our path, our thoughts, learn from our experiences, be open to what is possible, we end up with a beautiful life. Little flaws that show up in these vessels remind me that it sometimes takes more than one error to see and correct our flaws. On this bowl, the thread broke about every four inches. I have been sewing for a long time and know what to look for…like a crying baby that has no visible reason to cry, all was right with the machine…I was just working with some stubborn material! Sound like anyone you might know? This bowl was so much fun, as I painted bright colors on the cord first, and I like the brightness. 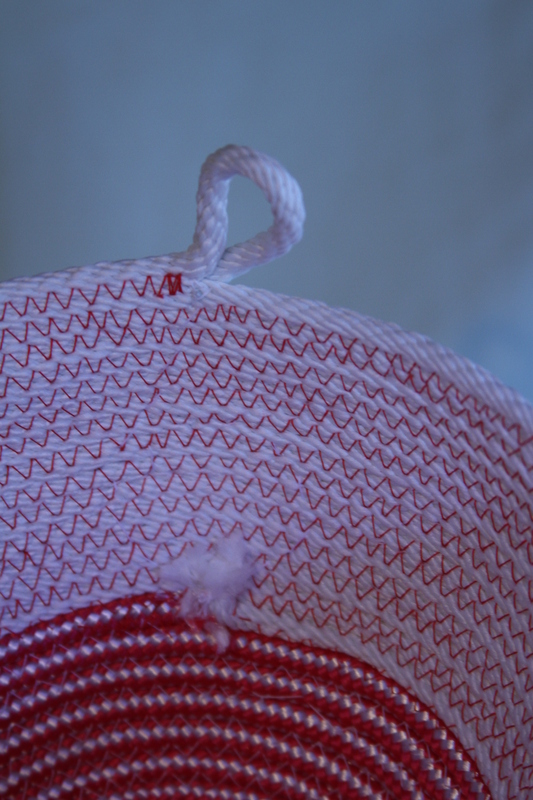 However, look at the seam of the plain and the colorful cords…not so smooth! This reminds me of the judgement that pervades society…sometimes like mixing oil and water, but it can finally connect! Two examples of this, actually…”red and yellow, black and white…” you get it, right? In life, we stop and start, take “two steps forward and three steps back”. 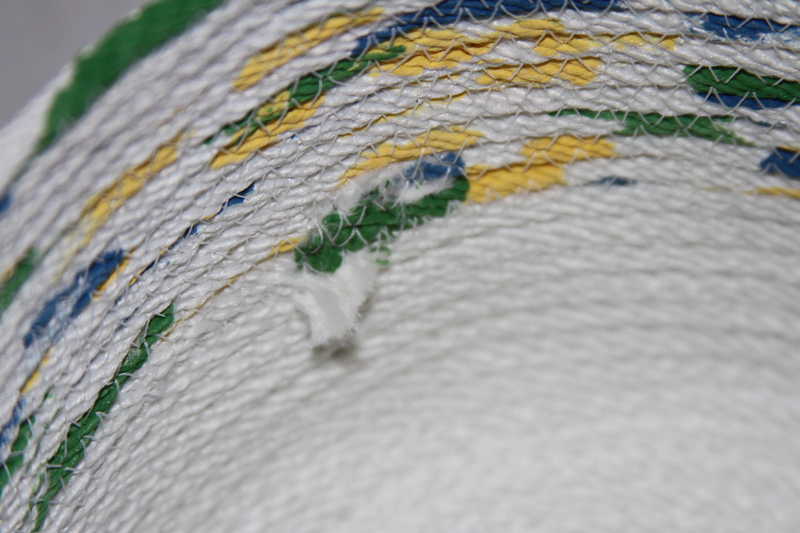 This is pointed out when the threads break and I have to back up, double stitch and move on. Some of these bowls stand perfectly tall and erect on their own and some are more wobbly. Each of them, however, can support contents…some heavier than others. All of us take shape in the best way we can and carry our loads, with or without the support of others. The last thing I will mention is the ending, what I will call the “flourish”. I sometimes wonder why it is that we don’t figure out how good life can be until we get close to the end. I hope that isn’t really the case and that I have a lot of time left, now that I have it all figured out…SURE!!!! Anyway, deciding how to finish off these vessels is another thing that makes them each unique. Some will have a knot; some will have more of a bow. Some will have an embellishment and some will just end. So, take this as you will…it was very meaningful for me! I try to think of who will use whatever I make and impart goodness and blessings into every item. 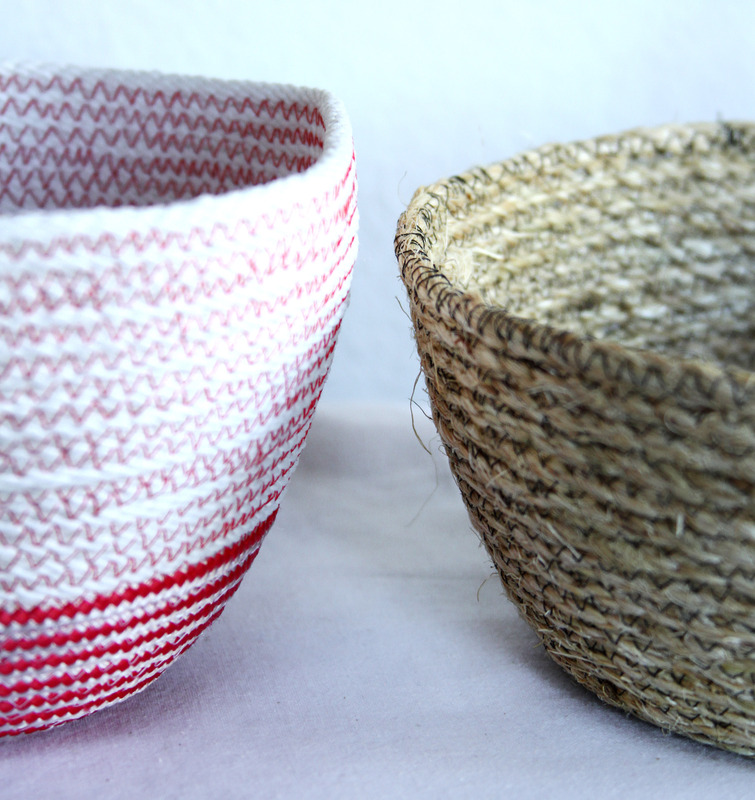 These bowls, or baskets, are no different. I will be putting them up on my Etsy site and I think I will enclose a note similar to this post with each shipment. Like a “message in a bottle,” I hope there will be a message in each one of these bowls for the new owner and that they will create a happy spot on some shelf of life…whether they are empty or full! Oh, and yes, for those of you who might be wondering…I will, indeed, clip the frays and strays on these special vessels before I ship them off. People will have to take them as they are or maybe they just won’t like the “real deal”! This young woman is smart! It took me a long time to learn this! Now that spring has arrived, we have more and more opportunities to sneak beneficial activities into our day, and you don’t have to be a super-athlete. In some areas, it may seem like we are not there yet, but you can still start taking these ideas to heart. Vitamin D – This past winter many more people have been diagnosed with low levels of Vitamin D. Guess what? SUNSHINE gives off natural Vitamin D. Yes, use common sense about exposure, but remember to get a few minutes of sunlight every day. Exercise – It’s time to start moving more of your body than the fingers needed to text, press the buttons on the remote or play video games. While you take a walk around the block, you get exercise AND sunshine on a nice day. Targeting 30 minutes of movement a day, you can break that up into 10 minute segments. As you gain stamina and see how much you enjoy it, you will naturally want to increase your time. Endorphins – So, while you are getting that exercise, you are generating endorphins that actually improve your mood. OK, maybe you don’t really want to be taking a walk, but make yourself and if you persist for just a bit, you will feel the benefits and then you will want to do it more often. Buddy-system – All of us need to make these changes so grab a buddy and double the good thing; a spouse, neighbor, child, whomever. The added benefit…improved relationships as you get better acquainted and share more when not in front of the TV or some other place where you don’t talk. Dance – We have all heard it said, “Dance like no one is watching!” It is another form of exercise and it doesn’t take a lot of it to feel better. Added benefit…the music will lift your spirits as you dance and you might just laugh or smile. Smile – Now there is a concept. Smiling is contagious and your smile can bring a smile to the next person’s face. Yes, it takes fewer muscles to smile than frown, but this isn’t about burning calories. This is about joy…and spreading it around. So there you have it…some spring ideas to get off your duff and see some change; change in your attitude, body and overall health. What could be better? I dare you! I was so excited to learn the reason for prayer flags, as noted in a recent post. I belong to a group called Spirit Sisters. (We now have one man, so maybe we should change the name?) At any rate, we share our spiritual journeys and it is a wonderful group. I decided to QUICKLY make up a set of flags for everyone that very day, as we were meeting to celebrate spring. If you know me, you know I don’t like to do things half way, but I was led to make prayer flags with the intended idea in mind…that they would fade, disintegrate and blow the prayers into the wind. The picture shows how rudimentary they are and I picked fabric that I did not believe would stand up well to the elements. I left room for them to write some of their own words, thoughts, prayers on them too. Well, they were very well-received and are going in gardens, windows, etc. Fun! At least they let me have my fun and passions. Again, very rudimentary, with easily understood messages and room to add more. Same flimsy fabric and I am going outside right now to hang mine up! Unusual to make something that you actually WANT to fall apart!!! 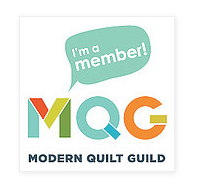 Tee hee…I know my prayers are being heard anyway, but this is fun and cheerful! Some Things DO Get Finished! Since I JUST posted about a new project (Prayer Flags)…I remembered I said I would follow up my fabric bag painting post with some finished pictures…. These are now for sale in my Etsy shop. Looks like it was sort of a purple haze! Oh and bacon….always bacon! Note to self: Now I have two more posts to get up on the blog…finished prayer flags and why I make bags!